Page 10 of the DCC Core Book asks us to pledge, with our right hand upon our little brown books, that we shall uphold the honor of the hobby of role playing to all comers, whether young or old. In this episode we discuss what it means to uphold the honor of the hobby to all comers and whether or not that only applies to those of different ages. Should we make an effort to make our gaming table and the game itself more open and inclusive to those of all walks of life: regardless of age, disability, ethnicity, gender, race, religion, sexuality, etc. Some of you listening may be saying “Well duh, of course,” and some of you may be saying “Oh great, now Spellburn is gonna get all preachy with their SJW nonsense”. Wherever you fall on that spectrum, we hope you’ll listen and join in on the conversation on social media afterwards! What’s his “day job”? Now I’m curious. I know Purple Duck is willing to look at work from new authors. Write it, pitch it, and make it happen! Be the diversity you wish to see! I’ve worked with a lot of publishers for DCC, and they are a pretty approachable lot. If you’ve got something worth publishing, you can find someone willing to publish it. The Third Party License for DCC is not particularly onerous, either. If you don’t want to go the route of finding another publisher, you can always do it yourself. Crawling Under a Broken Moon started as a zine, and is now a fantastic hardcover book with more on the way. Hubris began as blog posts. Thanks for the support of writers of adventures. Of which I hope to be. Write it. Knock it out of the park. The more voices writing for this game, the better. Just like Appendix N gave a diversity of voices to the original game, YOU give a diversity of voices to what this game is going forward. Fantastic episode. Keep up the great work spellburners! Thanks for the mention. While DCC is a favorite game of mine, I do love dipping my toes into a lot of different systems to see what they have to offer! Bushido, such a perfect system to help emulate a Kurosawa film! I was really glad to hear this episode. It’s easy to assume that DCC’s politics, like its ruleset, want to go back 44 years. 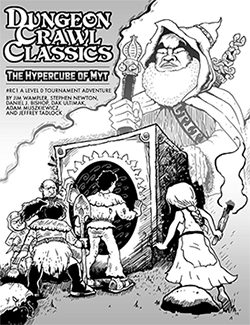 I worried about where the game’s heart is, and one of my reasons is on page 73 of DCC RPG (I have the 3rd printing, “Doorface” cover) in Table 3-4. On the guy’s shield, inside the runic writing and surrounding the boss, is the “Sonnenrad” or “Black Sun,” an occult Nazi symbol that is popular with the alt-right. I don’t know if Haas, the artist, is aware of the Nazi associations, but it’s hard not to know the symbol without also knowing what it stands for. I’ve blacked out that part of the shield with Sharpie so that I don’t have to look at it. Maybe future printings of the book could do the same? Runes, of course, are also big with neo-Nazis, although also with heathens, pagans and other people. Here, they’re harmless (“Imagination in All Things, F. Haas ’11”). Fascinating commentary, Chris. I had no idea.. I notice that this is not present in P. 73 on the fourth printing which I will have to look into more. Thanks ! I’ve been listening since episode 1 first came out, and I have to say, I think this was one of the most important episodes yet! I’m so glad that you addressed the problem of under-representation in our Hobby in an age when the idea is (finally!) spreading that representation matters! Thanks for that!